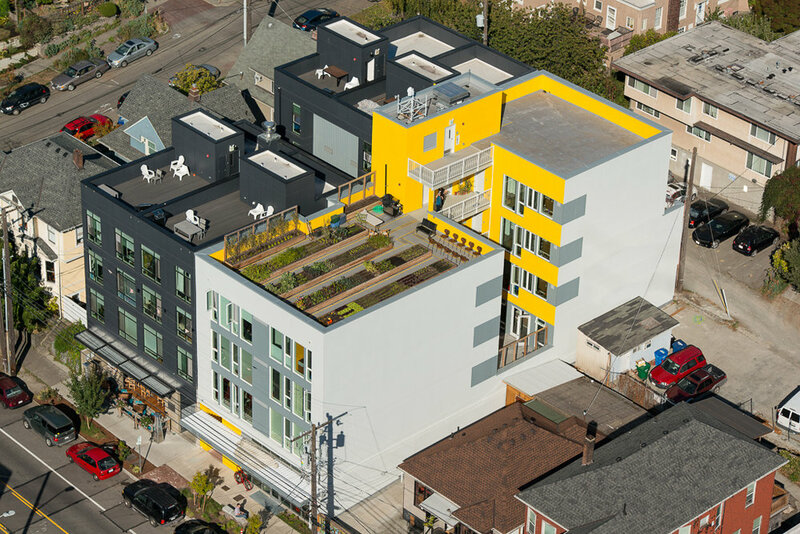 Capitol Hill Urban Cohousing, also known as CHUC, is a 5-story, mixed-use building in Seattle’s thriving Capitol Hill neighborhood. Although its physical appearance may be of a typical, urban infill, mixed-used project, the innovation lies in the development process that brought it into fruition. The ultimate, collective goal for the building - as determined by the future residents - was the construction of a community that will nuture both the individual and the family. We have very intentionally redefined the commonly held value of the home as investment commodity, instead prioritizing the longevity of the community. The development model is called Cohousing, which has its origins in Denmark, and is a concept by which a community of future residents embarks on a real estate development venture, with priority given to building social cohesion among residents during the design and construction process. At CHUC, the upper four stories comprise nine homes, each with a full kitchen and living space, and 2-3 bedrooms, in addition to shared indoor and outdoor amenity space. The street-level commercial space is home to the architecture practice of Schemata Workshop, owned by residents of CHUC. With community as the focus of the design effort, particular emphasis was placed on how the architecture could facilitate greater social interaction among residents. While traditional suburban cohousing models are typically stretched out along a pedestrian circulation path, for this urban context, the circulation is stacked around a small courtyard. All homes have physical proximity and views into this courtyard so that residents have a sense of connection to resident activity occurring within the community. Homes range in size from 850 to 1,300 square feet, and allowed for some limited customization to address personal preferences across the families comprising CHUC, though more is taking place as families settle in to their homes. While the construction budget was tight, emphasis was given to thermal and acoustic comfort in the the homes using optimized, passive energy strategies. The Common House is essentially a community room, and is located at the second level of the building, directly adjacent to the outdoor courtyard. The Common House includes dining for 30-people and a large kitchen that simplifies the preparation of large meals. Also included here are common laundry facilities, and a sitting room that can easily be closed off and used as a guest suite. A roof top garden provides produce for CHUC residents and a nearby farm-to-table restaurant, Lark, with spectacular views of downtown Seattle, and the Olympics beyond. A general information session and tour of CHUC is typically available at 10am on the second Saturday of each month. To sign up, please visit our ongoing event page here. Contact Schemata Workshop at 206.285.1589 or info@schemataworkshop.com for more information. "these families defied the odds by staying in seattle"
"cohousing and other home share solutions"
"at lark, you’ll soon be eating 12th ave-grown ‘lettuce and tender herbs’"
"a farm on the hill for lark"
"capitol hill's cohousing pioneers are ready to move in on 12th ave"
"developers use innovative strategies to deliver affordable housing"
"first-of-it's-kind capitol hill urban cohousing breaks ground on 12th ave"